From the beginning, this memoir tempted me with its title and its organization. I could not wait to read the personal email correspondences and peek into the life of author Antoinette Truglio Martin, a woman who retraces her yearlong journey through breast cancer. 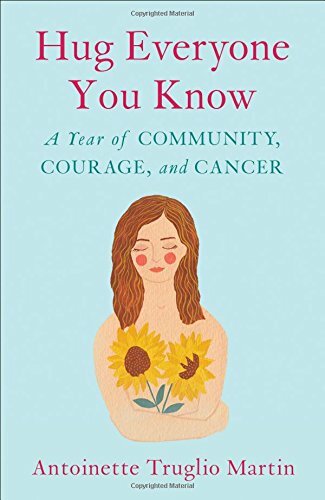 Although medical memoirs are often filled with sorrow and discomfort, “Hug Everyone You Know - A Year of Community, Courage, and Cancer” introduces the power of love and the blessings of a caring support structure. Amidst a devastating time in her life, the writer endeavors to keep her situation light and amusing. She attributes her positive mental attitude to “My Everyone” –her cast of characters that stretch from intimate family members to scores of friends and colleagues. Martin’s story is set in her Long Island hometown where she has grown deep Italian family roots and treasured beachside traditions. The author’s writing is part journal, part correspondence. To get the true flavor of Martin’s journey through breast cancer, we are offered a good look into her daily routine as speech pathologist, wife and mother. I find the email messages between the author and “My Everyone” to be honest, raw and consoling. The communications truly capture her experience and establish a fellowship - even a partnership - in the tragedy that is cancer. In time, her positive, no-nonsense attitude begins to rub-off on her friends, many who are also in the midst of cancer treatments. Their missives morph into a support network that supplies recommendations, commentaries and a general shoulder to cry or laugh on. And, as Martin continues to share her thoughts, progress and problems associated with her ailment, you see her becoming more and more steady and secure in the fact in that she is not alone. Her signature at the end of each message, “Hug Everyone You Know,” becomes the mantra for her predicament and her way of extending loving energy out to the world. Martin is not only a survivor but she is also a role model for those who will come after her. She is even coaxed by one of her beach pals to, “Keep those notes, - your attitude will someday help millions!” However, I believe that Martin’s top moment of courage is the critical, yet honest message she gives to the staff doctor as her “radiation humiliation” treatment sessions come to a close. “Hug Everyone You Know - A Year of Community, Courage, and Cancer” serves as evidence that encouraging words can be a psychological remedy for cancer. Antoinette Martin’s document is filled with messages of motivation, devotion, and sustenance; treasured solace she receives and transmits in the center of a terrifying diagnosis with life-changing consequences. She shares her crusade against cancer in hopes that it will bring determination and faith to others in need.